On or before Monday, April 2nd, 2018 all existing Access Web Apps hosted on Office 365 will become Read-Only. Continue to use the Azure SQL database behind that AWA as a read-only reporting database for a short while longer. Rescue your data from the Azure SQL database behind that AWA database using any one of the methods I've previously blogged about for a short while longer. The exact length of that extended data-rescue period is not clear. But it is clear that it won't be forever and that you can't allow a working database to go into read-only status. So, if you are currently using an Access Web App on O365, and you don't plan to install an On-Premises instance of SharePoint to support it, what is YOUR transition plan? In the online Access User Group Access Web Apps that I lead we've had a good run this year. In meeting after meeting we've had presentations from various presenters about their favorite Web App development tools. We consider all of them as potential alternatives to the Soon-to-be-Late AWAs. 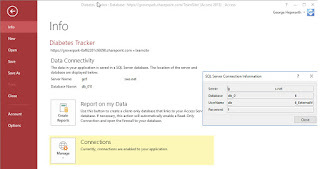 Access Desktop (accdb) with a SQL Server/SQL Azure database. Obviously, this approach won't work with the Azure SQL database currently deployed on O365 for your AWA. However, if you obtain a standard Azure account, you can migrate the database to it quite easily. I told you about that last year as part of a series on the issue. We had a few presentations on this approach in our AUG AWA Meetings. You can watch the videos on YouTube. You'll find other videos mentioned in this blog at both places. There's really one serious contender in this space, IMO, Alpha AnyWhere. I would recommend anyone looking at Web App development as a profession, or as a full-time role within your organization, at least take a look. In my opinion, though, it probably serves a different market from that targeted originally by AWAs. That said, it offers features, power and scalability that many others don't have quite yet. The main drawback would be the total investment required to implement this solution. Again, one primary offering from Microsoft exists at the moment, with a second one rapidly catching up. We learned about using the ASP.Net approach, based on MVCs, to rapidly scaffold out a working web app rapidly. This approach, quite naturally, requires a back end basebase, like SQL Azure. It can also be connected to an on-premises or remotely hosted SQL Server instance. I would imagine the most practical solution would be SQL Azure or a hosted SQL Server to which you can connect over the internet. If you are looking to make a relatively easy transition from AWAs to .net, this is the solution for you. And, if you also want a "grow up path", the fact that the same tools which you use to create the scaffolded, basic MVC app are right there in Visual Studio to take you as far as you want to go. We haven't really seen PowerApps this year in our AUG AWA group meetings, but there has been a parallel series of presentations from the AUG PowerApps group. In my opinion, PowerApps are still a year or two from being mature enough to be serious contenders. That said, the pace of development for PowerApps is so rapid that I wouldn't be surprised if they don't come to dominate the market for mobile app development in the very near future, The potential is there. Most of the remaining contenders are in this category. My favorite is ScriptCase, with ZOHO Creator a close second. Both are browser-based development environments. The primary difference, from what I can see, is that ScriptCase is able to connect to a wider variety of back ends, whereas ZOHO seems to be tied to its own data store. We didn't look at all of the possibilities. To be honest I mostly selected development tools I'd previously seen, or for which I could find a presenter who actually used the tool. A Hosted Environment for your existing AWA. Not surprisingly, there are still ways to run your existing Access Web Apps, even if you can no longer do so on Office 365. I know of at least two different options. One is offered by Rob Koelman's group MetaMicro Automatisering BV in Europe. I've found Rob to be one of the more knowledgeable persons around with regard to AWAs. The other is Apps 4 Rent. I know very little about them, although I am aware of AWAs being moved there. So, that's it. We've had a good year, learned a lot, and come to terms with the impending transition. If you'd like to join us to see "what's next", please feel free to drop in, or catch a video.